Salmonella enterica subsp. diarizonae (IIIb) is frequently isolated from the environment, cold-blooded reptiles, sheep and humans; however only a few studies describe the isolation of this subspecies from invasive human infections. The factors contributing to this unusual behavior are currently unknown. We report here the genome features of two diarizonae strains, SBO13 and SBO27, isolated from endocervical tissue collected post-abortion and from cerebrospinal fluid of a newborn child, respectively, in the city of Santa Cruz, Bolivia. Although isolated six years apart, SBO27 in 2008 and SBO13 in 2014, both strains belong to the same sequence type 1256 (ST1256) and show a high degree of genome conservation sharing more than 99% of their genes, including the conservation of a ~ 10 kb plasmid. A prominent feature of the two genomes is the presence of 24 genomic islands (GIs), in addition to 10 complete Salmonella pathogenicity islands (SPI) and fragments of SPI-7, a pathogenicity island first reported in the human-adapted serovar Typhi. Some of the GIs identified in SBO13 and SBO27 harbor genes putatively encoding auto-transporters involved in adhesion, lipopolysaccharide modifying enzymes, putative toxins, pili-related proteins, efflux pumps, and several putative membrane cation transport related-genes, among others. These two Bolivian isolates also share genes encoding the type-III secretion system effector proteins SseK2, SseK3 and SlrP with other diarizonae sequence types (ST) mainly-associated with infections in humans. The sseK2, sseK3 and slrP genes were either absent or showing frameshift mutations in a significant proportion of genomes from environmental diarizonae isolates. The comparative genomic study of two diarizonae strains isolated in Bolivia from human patients uncovered the presence of many genes putatively related to virulence. The statistically-significant acquisition of a unique combination of these functions by diarizonae strains isolated from humans may have impacted the ability of these isolates to successfully infect the human host. The genus Salmonella comprises Gram-negative pathogenic bacteria that infect a large variety of hosts, including humans, livestock, reptiles, birds and insects . The genus includes two species, S. enterica and S. bongori, with S. enterica further subdivided in six subspecies: enterica (I), salamae (II), arizonae (IIIa), diarizonae (IIIb), houtenae (IV), and indica (VI) . S. enterica subsp. enterica is responsible for most infections in warm-blooded (homeotherm) animals and comprises more than 1580 serovars that are differentiated by distinct somatic (O-antigen of the lipopolysaccharide, LPS) and flagellar antigenic formulae . Some of these serovars are host-adapted while others cause diseases in a broad range of hosts . Host-adapted serovars are frequently associated with systemic diseases like typhoid fever. In contrast, non-typhoidal Salmonella (NTS) often cause gastroenteritis in immunocompetent hosts. NTS serovars have also been linked to bacteraemia in immunocompromised and even in immunocompetent individuals . The most common NTS isolated from human patients include Enteritidis, Typhimurium, Infantis and Newport [5, 6]. Although more than 99% of the S. enterica strains isolated from human patients belong to the subsp. enterica, it is not unusual, especially in children, to find reports describing isolation of strains belonging to other subspecies . Many of these cases involve Salmonella infections linked to contact with cold-blooded animals, like reptiles kept as pets [8, 9]. Some studies have shown the presence of all Salmonella subspecies as part of the reptile gut microbiota, which may represent a risk of transmission to more susceptible (warm-blooded) hosts . Pet snakes are reported to be an important reservoir of S. enterica subsp. diarizonae (hereafter diarizonae) . This subspecies is also often isolated from sheep [11–14] and is increasingly associated with infections in humans. Although in some of these cases the source of the infection could be traced to reptile pets and consumption of sheep meat [15–17]; it remains unknown whether human-to-human transmissions occur. In this study, we report the genome analysis of two diarizonae strains with antigenic formula 48:i:z and sequence type ST1256, which were isolated from human patients in the city of Santa Cruz, Bolivia. Although these two isolates were isolated 6 years apart (2008 and 2014), our analysis shows a high degree of genome synteny between them. Remarkably, these two Bolivian isolates share a defined set of putative virulence genes with diarizonae of other sequence types (ST) mainly-associated with human infections. These factors include some effector proteins translocated by type III secretion systems, a genomic island (GI-6) and a fragment of the Salmonella pathogenicity island 7 (SPI-7). Pet snakes are common reservoirs of diarizonae and, consequently, potential transmission sources. However, invasive infections in humans are rarely reported [10, 15, 17, 18]. Accordingly, we were interested in analyzing the genome of two diarizonae strains isolated from two human samples in the city of Santa Cruz, Bolivia. These strains were cultured from cerebrospinal fluid of a 36 h-old newborn that died (strain SBO27, isolated in 2008) and, endocervical tissue collected from a 23-year old woman who miscarried after ten weeks of pregnancy (strain SBO13, isolated in 2014). There was no record of the immune status of the infected pregnant woman whereas no immune or weight defects were observed in the newborn. This newborn was however delivered by a mother having urinary infections during pregnancy. In the initial phenotypic analyses, isolates SBO13 and SBO27 were identified as diarizonae, as they are positive for malonate utilization but negative for dulcitol fermentation. Plasmid profile analyses showed the presence of one plasmid of ~ 10 kb in both strains. Antimicrobial susceptibility tests indicated that SBO13 and SBO27 are susceptible to most common beta-lactams, aminoglycosides, trimethoprim-sulfametoxazol and quinonoles. Both SBO13 and SBO27 strains were assigned to serovar IIIb 48:i:z by serological and molecular methods, according to the White-Kauffmann-Le Minor scheme . Multi-locus sequence typing (MLST) analysis revealed that both isolates belong to ST1256, according to the Achtman scheme . Serovar designation and ST were confirmed using the genome sequence and the ST prediction tool available in the EnteroBase database (https://enterobase.warwick.ac.uk/). The draft genomes of the diarizonae isolates SBO13 and SBO27 have 5,031,187 and 5,035,353 bp, respectively, with a G + C average content of 51.4%. The genome of SBO13 has a coding capacity for 4649 predicted proteins, 8 rRNAs, 80 tRNAs, and 165 ncRNAs (GenBank accession #PVNR00000000). The coding capacity of the SBO27 genome accounts for 4635 predicted proteins, 8 rRNAs, 80 tRNAs and 165 ncRNAs (GenBank accession #PVNQ00000000). SBO13 and SBO27 harbor one plasmid of 9377 and 9246 bp, respectively, with a notorious synteny and similar gene content (Additional file 1: Table S1). No antibiotic resistance-related genes were identified in these small plasmids, which encode several hypothetical proteins of unknown function, two putative regulatory proteins and an integrase (Additional file 1: Table S1). Despite the sensitivity of SBO13 and SBO27 to many antimicrobials, a search in the ‘Comprehensive antibiotic resistance database’ (CARD) (https://card.mcmaster.ca/), revealed the presence of a reduced number of genes linked to antimicrobial resistance in both isolates. These consisted mainly of genes encoding components of efflux pumps of the major facilitator superfamily (MFS). Mutant alleles in glpT and uphT, which confer fosfomycin resistance based on a target modification mechanism, were also detected (Additional file 2: Table S2). The genomes of SBO13 and SBO27 were initially annotated with Prokka  for phylogenomic analyses (see Methods) and subsequently by NCBI following our submission. To functionally analyse the SBO13 and SBO27 genomes, we used the subsystem annotation available at RAST server (http://rast.nmpdr.org/) [21, 22], which allows classification by biological processes. In SBO13, a total of 2771 protein-encoding genes were allocated to 571 annotated subsystems, defined as biological processes or structural complexes supported by a set of functional roles . Most of these genes were predicted to be involved in carbohydrate (697 genes) and amino acid (439 genes) metabolism (Additional file 3: Figure S1). Interestingly, a considerable number of genes, 237, were predicted to be associated with transport-related processes and another 130 genes predicted to encode protein secretion systems, some of which have been identified as important traits involved in bacterial virulence and pathogenesis . Similar results regarding the distribution of genes in the different subsystems categories were obtained for the SBO27 genome (not shown). To infer the phylogenetic affinities of the SBO13 and SBO27 genomes, we estimated a maximum-likelihood phylogeny from the consensus pan-genome (presence-absence) matrix of 18,446 consensus clusters computed from 109 genomes representative of the distinct Salmonella species and subspecies (Fig. 1). From the 551 diarizonae genomes available in EnteroBase in an accessible status (Additional file 4: Table S3), we included in the analysis 70 draft (Additional file 5: Table S4) and 6 complete genomes (Additional file 6: Table S5). These were selected based on two main criteria. First, the different source and geographic location of the isolate; and, secondly, a sample size roughly proportional to the number of isolates with a particular ST (see Methods). The pan-genome phylogeny resolved the S. bongori and S. enterica species clades and the six S. enterica subspecies with maximal support (Fig. 1). The Bolivian isolates SBO13 and SBO27 formed a perfectly supported tree with other ST1256 isolates. The remaining diarizonae genomes also grouped mainly by their respective ST (Fig. 1). However, there was no apparent clustering of the diarizonae genomes by their isolation source, implying that no major differences in genome content exists among diarizonae isolates from human, animal, plant or environmental sources (Fig. 1). This is reflected by the observation that most major diarizonae clades contain strains from different sources (Additional file 4: Table S3). On the other hand, the maximum-likelihood core-genome phylogeny computed from 1058 top-scoring markers selected by the GET_PHYLOMARKERS pipeline  out of the 1650 consensus clusters (see Methods) computed by GET_HOMOLOGUES , resolved the same major groups (species and subspecies) within the Salmonella genus; although, as expected, with much lower resolution within the S. enterica subspecies (Additional file 7: Figure S2). As mentioned above, the MLST analyses showed that SBO13 and SBO27 belong to the ST1256 (Additional file 5: Table S4). This is the fourth most abundant ST for diarizonae found in EnteroBase as of September 2018 (https://enterobase.warwick.ac.uk/). Interestingly, diarizonae strains with ST1256 are recovered mainly from human infections (37 of 40 isolates) (Additional file 4: Table S3). To date, isolates of ST1256 have been only reported in Europe and North America (Additional file 4: Table S3), which make SBO13 and SBO27 the first cases of diarizonae ST1256 isolated from South America. Similar to ST1256, other abundant diarizonae STs also display association with human infections. That is the case of ST233 (37 of 52 isolates); ST430 (21 of 31 isolates); and, ST432 (15 of 51 isolates, some of them with no source information). There are, however, other abundant STs, like ST63, isolated mainly in North America, for which human isolates are rare (1 of 28 isolates) (Additional file 4: Table S3). These differences also depend on important parameters such as the geographic location in which the strains were obtained. For example, a high percentage of the diarizonae STs strongly associated with human infections (ST233, ST430 and ST432); however, most strains were isolated in the United Kingdom (Additional file 4: Table S3). Therefore, this apparent association between STs and human sources may in part reflect a sampling bias. Overall, diarizonae strains appear to have a broad ecological valence, which indicates that much remains to be learned about their environmental distribution, molecular basis of host colonization and tissue tropism. To further characterize the genomes of diarizonae isolates SBO13 and SBO27, an all-against-all BLAST comparison was performed using nine complete genomes from distinct Salmonella species, subspecies, and serovars. These genomes included: six diarizonae strains with complete genome (Additional file 6: Table S5); S. bongori (strain NCTC_12,419); serovar Typhi (strain CT18); and serovar Typhimurium (strain SL1344) (Fig. 2a). A total of 24 genomic islands (GIs), designated as GI-1 to GI-24 were predicted in SBO13 and SBO27 using SIGIHMM and IslandPath-DIMOB (Fig. 2a, Additional file 8 : Table S6). Two islands, GI-17 and GI-20, were found in SBO13 and SBO27 and mostly absent in the rest of the genomes analysed (Fig. 2a). Detailed inspection of GI-17 and GI-20 revealed the presence of predicted phage-related genes along with a high proportion of genes encoding hypothetical proteins, suggesting that they are likely remnants of prophages acquired by these two strains. In addition, SBO13 and SBO27 contain an additional 11.8 kb terminal extension at GI-18 that is absent in the rest of strains analysed, making it the largest GI found in diarizonae (115 kb). This GI-18 region harbors genes encoding for predicted proteins related to virulence such as fimbrial proteins, an efflux system and a putative toxin (Additional file 8: Table S6). Interestingly, the analysis of two other large islands, GI-1 and GI-19, also revealed the presence of genes putatively involved in virulence. For example, genes encoding predicted proteins with homology to toxin-coregulated pilus biosynthesis-like proteins E (TcpE) (SBO13_30280) and TcpQ (SBO13_30220) , were found in GI-1; while several genes predicted to be related to iron transport such as the ferrous iron permease, efeU, the cytoplasmic ferritin, ftn, or the Fur regulated iron transporter, sitA, were identified in GI-19 (Additional file 8: Table S6). Accordingly, it is known that iron increases the pathogenic potential of Salmonella and other enteric pathogens during the infection of the intestinal epithelium . On the other hand, some of the genes present in GI-6 and shared by SBO13 and SBO27 define a cluster of genes that is flanked by two transposase-encoding genes and is mostly predicted to be related to membrane transport (Fig. 2b, Additional file 8: Table S6). Most genes of this cluster have homologs in diarizonae strain HZS154 (isolated from stool of a human patient), including an auto-transporter bearing an outer membrane beta-barrel domain (SBO13_24810, SBO13_24900), a disulfide bond formation protein B, DsbB (SBO13_24840), an ABC-transporter (SBO13_24870), an iron permease (SBO13_24860), an outer membrane porin (SBO13_24880) and an O-antigen LPS length determinant protein (SBO13_24890), among others (Fig. 2b, Additional file 8: Table S6). Although there are few human clinical reports from S. enterica isolates not belonging to subsp. enterica [7, 18], diarizonae has been found sporadically responsible for maxillary sinusitis, bacteremia, cervical lymphadentitis and gastroenteritis in adults and children [15, 17, 28, 29]. Our whole genome comparison revealed that diarizonae SBO13 and SBO27 harbor 10 known Salmonella pathogenicity islands (SPI-1, SPI-2, SPI-3, SPI-4, SPI-5, SPI-9, SPI-11, SPI-13, SPI-18, and SPI-21) and a significant portion of SPI-7 (Fig. 2a). SPI-21, which encodes a type VI secretion system as well as the bacterial protein toxins pyocins, is shared only by diarizonae and arizonae and has been proposed to enable these two subspecies to compete with other bacteria . Of interest, all diarizonae genomes lack SPI-6 and SPI-12, which have been shown to be important for competition and virulence in subsp. enterica [31, 32]. The most intensively studied pathogenicity islands in Salmonella are SPI-1, SPI-2, SPI-3, SPI-4, and SPI-5, which play important role in adhesion, invasion and the intracellular lifestyle of the pathogen . To assess putative differences in these five islands among diarizonae strains, we analysed their gene content by BLAST in SBO13 and SBO27 and, in a representative group of 15 diarizonae strains collected from human, animal, plant and environmental sources (Additional file 6: Table S5). Among these are included those six diarizonae isolates with known complete genome used in previous analyses. 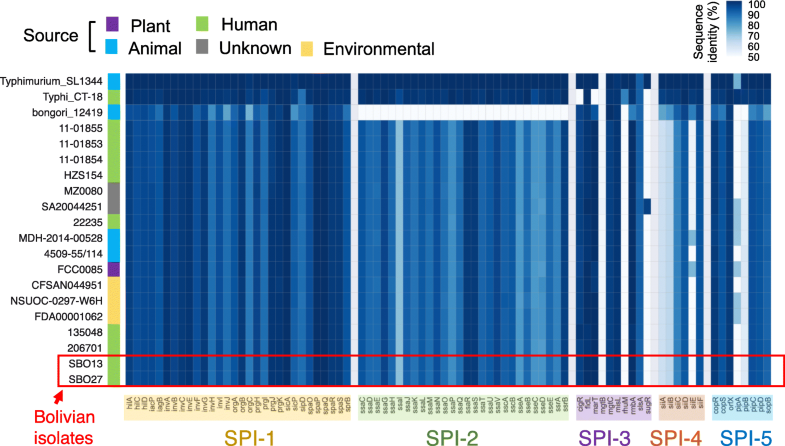 High conservation in gene content was observed for these pathogenicity islands (SPI-1 to SPI-5) in all diarizonae isolates, irrespective of their origin (Fig. 3). SPI-7 in serovar Typhi comprises a DNA region of 134 kb, which contains approximately 150 predicted genes . In addition, SPI-7 has a mosaic structure, comprising regions thought to be involved in island mobility and other regions implicated in virulence: the viaB- operon, related to production of Vi antigen; a prophage region encoding the SopE type-III effector; a type-IV secretion system (pil-locus); and, the rep-cluster, with homology to a plasmid replication regions . SPI-7 was first discovered in Typhi but it has been also found in serovar Paratyphi C and some strains of serovar Dublin [36, 37]. Noteworthy, although a recent study showed SPI-7 to be present in the genome of diarizonae strain 1579 and absent in strain 639, no further details about the gene content of this particular SPI-7 fragment were provided . To gain further insights into the organization of the diarizonae genomic region containing SPI-7 genes, a sequence homology analysis using SPI-7 genes from Typhi strain CT-18 was run with the same set of diarizonae genomes used in the analysis of SPI-1 to SPI-5 islands: 15 representative diarizonae strains from diverse sources along with SBO13 and SBO27 (Additional file 6: Table S5). The initial TBLASTN analysis using as queries SPI-7 proteins from Typhi strain CT-18 detected 66 of a total of 128 genes of the SPI-7 island in SBO13 and SBO27 with a coverage of ≥85%. Moreover, the SPI-7 genes found showed a high synteny compared to Typhi SPI-7 (Additional file 9: Figure S3, see below). Since a high proportion (22/66) of those TBLASTN-hits showed low-medium identity at the protein level (~ 40–50%), we decided to assess the TBLASTN analysis using an identity cut-off > 40%. The SPI-7 gene distribution divided the 17 diarizonae strains analyzed in three main clades, A, B and C (Fig. 4). Clade A, which bears a significant portion of the sopE phage but lacking other virulence-related regions, included strains outside the subsp. diarizonae and a few diarizonae strains from diverse sources (Fig. 4). Clade B, composed of diarizonae strains from diverse sources, missed a large portion of SPI-7 while clade C, in which SBO13 and SBO27 were present, bear a significance portion of SPI-7 genes predicted to be related to virulence (pil-locus and tra-region) (Fig. 4). As expected, the Vi capsule polysaccharide-biosynthetic operon (viaB) was absent in all the diarizonae strains analysed (Fig. 4). In the case of the Bolivian isolates SBO13 and SBO27, we found homology with several regions of serovar Typhi SPI-7: the rep cluster (homology to plasmid replication region), the pil locus, genes from the tra region involved in DNA transfer, and most genes from the STY4663-cutA3 region, including an ortholog of the Typhi integrase int-4680 (Fig. 4 and Additional file 9: Figure S3). The only region implicated in virulence found in this diarizonae SPI-7 fragment was therefore the type IVB pilus (pil) locus (Fig. 4). The type-IVB pilus system has been characterized in Typhi and Dublin as an important element in adhesion to and/or invasion of human epithelial cells [36, 38]. This type IVB pilus is also involved in increasing the inflammatory response in monocytes . Hence, the presence of the pil locus in diarizonae SBO13 and SBO27 could have contributed to their ability to infect humans. For some pil gene products, the level of amino acid identity of the SBO13 and SBO27 pili proteins was ≤50% when compared with the orthologous Typhi pili proteins. This observation opens the possibility of different acquisition events of the locus, at least for some sub-regions (Additional file 9: Figure S3). Interestingly, despite showing high sequence identity between diarizonae and Typhi, the STY4663-cutA3 cluster appears upstream of parB-ssb region in diarizonae instead of the 3′ terminal region as in Typhi (Additional file 9: Figure S3). It is also notorious the lack of genes coding for the Vi capsule polysaccharide (viaB operon) and, as mentioned above, the absence of most of the SopE-phage. This scenario is reminiscent of that seen in other pathogens harboring genomic islands that share synteny with SPI-7 such as Pseudomonas fluorescens, Ralstonia metallidurans or Yersinia enterocolitica . In all these cases, the SPI-7 viaB operon is either absent or replaced by other genes. Bacteriophages and phage remnants are found in most of Salmonella genomes and play an important role in both inter-species and inter-strain variability [40, 41]. Four regions were identified in the chromosome of diarizonae SBO13 and SBO27 using the PHASTER tool (Fig. 2a, Additional file 10 : Table S7). PHASTER predicted the presence in these four regions of ‘incomplete’ set of genes, therefore likely corresponding to phage remnants. Two of these phage remnants -numbers 3, 4 in SBO13; and, 2, 3 in SBO27- have the same length and G + C content in the two strains, suggesting that they correspond to the same genetic element. The identified phage remnants displayed a mosaic of genes from related bacteriophages such as SEN34, Gifsy1, P4, and prophage elements from other bacterial genera. Among the genes mapping to these phage remnants, we found one encoding the virulence factor PagK. This protein and its homologues (PagJ and PagK2) belong to a set of virulence factors proposed to be translocated into the host cytoplasm of macrophages via bacterial outer membrane vesicles . It has been reported that Salmonella strains lacking these three homologues are attenuated for virulence in murine infections  (Additional file 10: Table S7). The precise role of these phage remnants, which encode a high number of hypothetical proteins, in the biology of SBO13 and SBO27 is yet to be explored. Effector proteins translocated into eukaryotic host cells by specialized type-III secretion systems (T3SS) contribute largely to Salmonella virulence [43–45]. The combined action of these effector proteins allows Salmonella to alter host cell functions enabling intracellular survival and replication within eukaryotic cells and transmission [44, 45]. Likewise, many studies have demonstrated a prominent role of diverse adhesins in promoting the interaction of Salmonella with host cells . To further investigate virulence-related traits in diarizonae SBO13 and SBO27, we searched by TBLASTN the presence of type-III effector proteins and adhesin operons in the Virulence Factors DataBase (VFDB, http://www.mgc.ac.cn/VFs/) (Additional file 11: Table S8) using the set 15 diarizonae genomes previously described (Additional file 6: Table S5). This comparative analysis revealed that 12 out of 41 type III effectors were encoded by all the diarizonae genomes: SteC, SseJ, SseG, SseF, SptP, SopE, SopE2, SopB, SipA, SipB, SipD and AvrA (Fig. 5). Interestingly, 11 out of the 17 diarizonae strains examined, including SBO13 and SBO27, harbor genes encoding the glycosyltransferases SseK2 and SseK3, which impair proper immune response to infection via TNFα-stimulated NF-κB signaling . Noteworthy, 8 out of the 9 diarizonae strains associated with human infections were positive for sseK2 and sseK3 (Fig. 5). Moreover, an extra type III effector, SlrP, was found in some of the strains associated with human and animal infections (Fig. 5). SlrP has E3 ubiquitin ligase activity and has been shown to inhibit the release of IL-1β . A detailed inspection of the SlrP amino acid sequence across the diarizonae strains analyzed revealed that SlrP was present in some isolates as a truncated protein due to a frame-shift mutation (Fig. 5). As mentioned above, SrlP appears as the full-length version in the Bolivian strains SBO13 and SBO27 (Fig. 5). SlrP interacts with mammalian thioredoxin-1 leading to a decrease in thioredoxin activity and host cell death . Hence, the incorporation of SlrP together with the glycosyltransferases SseK2 and SseK3 might have facilitated infection in humans by the SBO13 and SBO27 isolates. Noteworthy, no selective acquisition or loss of fimbrial operons was observed for the diarizonae isolates examined. The only exception was the stdA and stdC fimbrial genes, which in the Bolivian isolates SBO13 and SBO27 encode proteins with a low coverage (lower than 50%) in comparison to other diarizonae strains (Fig. 5). 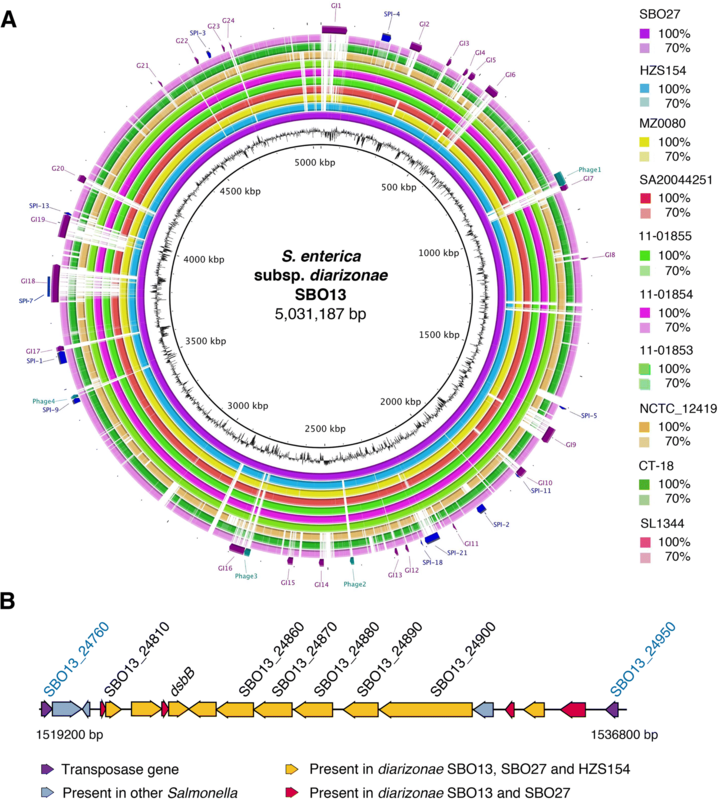 The genome analysis of diarizonae SBO13 and SBO27 revealed a defined set of distinctive features linked to virulence such as the SPI-7 pil-locus, the transport-related cluster of GI-6, and genes the T3SS effectors SlrP, SseK2 and SseK3. To get additional insights about the distribution of this set of genes in other diarizonae strains, the presence of these markers was assessed by TBLASTN in the 376 diarizonae draft genome assemblies available at EnteroBase (https://enterobase.warwick.ac.uk/) (Additional file 12: Table S9 and Additional file 13: Table S10). These 376 genomes comprised those ST with a minimum of 5 isolates. The SPI-7-related pil-locus was found in 44.8% of the diarizonae genomes whereas the GI-6 cluster was found only in 29.6% of them (Additional file 14: Table S11). Therefore, these genome regions are present in less than half of the diarizonae genomes analyzed. The genes encoding the T3SS effectors SlrP, SseK2 and SseK3 were found in 80.5, 46.9 and 45.9% of the 376 diarizonae genomes, respectively (query coverage ≥85%; Additional file 14: Table S11). To test the possibility that these virulence factors -SlrP, SseK2, SseK3, GI-6 and SPI-7- could be involved in facilitating human infection, we analyzed their distribution in diarizonae STs statistically associated with humans (Fisher exact test p-value < 0.05) (Additional file 13: Table S10). Among these virulence-related functions, SlrP, GI-6 and SPI-7 were not only over-represented in STs statistically associated with the human host, but also in isolates collected from human infections regardless of whether their respective STs were associated or not to human host (Additional file 14: Table S11). Even more, in five STs: 1845, 3996, 4086, 876 and 1256 (SBO13 and SBO27), recovered mainly-from human infections (Fisher exact test p-value < 0.05) (Additional file: 13: Table S10), these virulence determinants were presents at least in the ≥75% of the isolates (Additional file 13: Table S10). Altogether, these data suggest that this repertoire of virulence factors could contribute in subspecies diarizonae to increase the potential to cause infection in humans. This study provides insights into the genome structure of two diarizonae strains, SBO13 and SBO27, which were isolated in Bolivia from invasive infections in humans. Pan-genome phylogeny clustered these two Bolivian isolates with diarizonae strains of same genotype, ST1256, with no obvious differences with other diarizonae ST comprising mainly-human, animal or environmental isolates. However, the subsequent study of virulence-related functions encoded by the SBO13 and SBO27 genomes pointed to a unique gene repertoire that may facilitate infection of the human host. The statistical analyses revealed that, as it occurs in SBO13 and SBO27 strains, a higher percentage of diarizonae human isolates harbor genes encoding the type III effectors SseK2, SseK3 and SlrP; the SPI-7 pil-locus, and predicted membrane transport-related genes mapping in GI-6. The strains were isolated from two human infection cases and sent to the National Centre for Tropical Diseases (CENETROP, Santa Cruz, Bolivia). Strain SBO27 was obtained from cerebrospinal fluid from a 36 h-old neonate who died in 2008, and strain SBO13 was isolated from endocervical tissue collected post-abortion at ten-weeks of gestation from a 23-year old pregnant female in 2014. The isolates were identified as S. enterica by standard biochemical tests. The antigenic formula was evaluated by serology and by PCR, and plasmid profiles were visualized as previously described . Antimicrobial susceptibility tests were performed by the Kirby-Bauer disk diffusion method and the breakpoints were considered according to the Clinical Laboratory Standards Institute . For strains SBO13 and SBO27 strains, the initial multi-locus sequence typing (MLST) was performed by PCR and sequencing as described elsewhere , and confirmed after genome analysis using a web tool available at https://cge.cbs.dtu.dk/services/MLST/. Purified genomic DNA was commercially sequenced at the Genomics Core of Arizona State University on an Illumina MiSeq instrument (~ 550 bp PE libraries; 2 × 300 sequencing cycles). Genome assembly and annotation were performed as previously described . Briefly, the reads were processed with trimmomatic  to remove adaptors and trim poor-quality bases before de-novo assembly using spades 3.11.0 . Scaffolds were ordered using multiple complete diarizonae genomes as references with the aid of MeDuSa v1.6 . The resulting assemblies were subjected to a final polishing step by remapping reads with BWA (Li and Durbin, 2009) and using Pilon v1.22  to correct the sequences and gap filling/closure. In-house annotation was performed with Prokka  and a local S. enterica-specific database of selected reference sequences (Prokka annotation data are public and available at https://figshare.com/s/38a6ebb54e78e5885b31). Sequences released to the public domain were annotated with the NCBI prokaryotic genome automatic pipeline during the submission process. S. enterica subsp. diarizonae genome assemblies downloaded from EnteroBase as FASTA-formatted contigs were likewise annotated with Prokka. The genomes were aligned with MAUVE aligner version 2.4.0 using the progressive algorithm with default settings . Genome comparison was undertaken using BLAST Ring Image Generator (BRIG) . Salmonella pathogenicity islands (SPIs), T3SS effectors and GI-6 transport related gene cluster were analyzed using TBLASTN. Putative island prediction was conducted using IslandViewer4 . The genomic context of SPI-7 genes was drawn and analysed using EASYfig software . Prophages sequences were predicted using the PHASTER server, a new version of PHAST . Antibiotic resistance genes were searched using the Comprehensive Antibiotic Resistance Database (https://ardb.cbcb.umd.edu/blast/)  and Resfinder . The annotation of clusters of orthologous groups (COGs) was generated using eggNOGmapper . For Cluster analysis and visualization, we used the Python visualization library, Seaborn . Clustering analysis was performed using the complete linkage method. Core- and pan-genome phylogenies were estimated under the maximum-likelihood (ML) optimality criterion using the GET_HOMOLOGUES  and GET_PHYLOMARKERS  software suites. Briefly, get_homologues.pl was used in combination with compare_clusters.pl to compute a consensus core-genome, resulting from the clustering of the all-against-all BLASTP results (with query coverage ≥90%; -C 90) with the BDBH, COGtriangles and OMCL algorithms implemented in GET_HOMOLOGUES, as detailed elsewhere . A consensus pan-genome was computed in a similar manner from the COGtriangles and OMCL clusters. The consensus core-genome clusters were then fed into the GET_PHYLOMARKERS pipeline to select alignments with optimal phylogenetic attributes, namely those without significant evidence for recombination, producing tree topologies and branch-lengths not significantly deviating from the expected distribution of these parameters under the multispecies coalescent, and displaying average branch support values > 0.6 (see  for the details). The alignments passing these filters were concatenated and a ML phylogeny estimated with IQ-TREE 1.6.1  using the best fitting model and selecting the phylogeny with the highest likelihood score from those found among independent searches. The ML pan-genome phylogeny was estimated from the pan-genome (presence-absence) matrix computed by compare_clusters.pl from the GET_HOMOLOGUES suite with the aid of the estimate_pangenome_phylogenies.sh script from the GET_PHYLOMARKERS package, which calls IQ-TREE to fit the binary model to the data, and performing ten independent searches under the best-fit model. Phylogenetic trees were displayed and edited with FigTree v1.4.3. The EnteroBase database (http://enterobase.warwick.ac.uk/species/index/senterica) was examined to determine the sequence type (STs) assignment for the strains (besides SBO13 and SBO27) included in this study and to analyze draft genomes of other diarizonae strains. As of September 19, 2018; 757 diarizonae entries were found in EnteroBase. From these, 551 draft genome assemblies were available and downloaded as FASTA-formatted contigs. For the phylogenetic analysis, a sample of 76 diarizonae genomes were selected (Additional file 4: Table S3 and Additional file 5: Table S4) based on two main criteria. First, different source and geographic location of the isolation, and secondly, a representative sample roughly poportional to the number of isolates with a particular ST. We only considered those diarizonae genomes with STs represented in EnteroBase by more than 5 isolates. These STs were further differentiated in three classes, having 5–10, 11–20 and > 21 isolates. We further selected 2, 3 and 5 representative strains for each ST falling in each of these three classes, which conformed the 76 diarizonae genomes indicated above (Additional file 4: Table S3 and Additional file 5: Table S4). 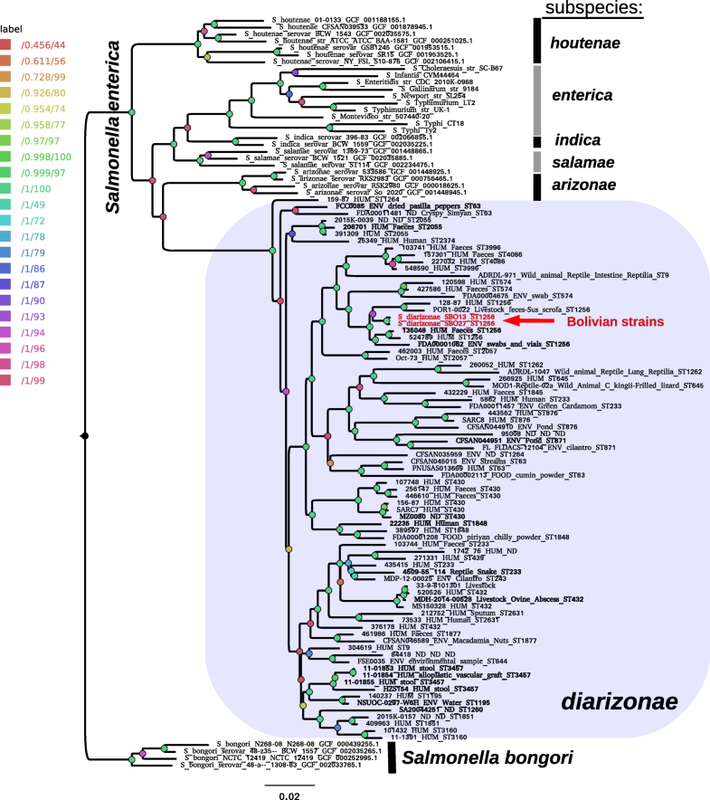 A subsample of 15 diarizonae strains was selected from the pan-genomic phylogenetic tree (Fig. 1 and Additional file 6: Table S5) and used for gene content comparative analyses (Figs. 3, 4 and 5). For statistical association analyses, only STs with ≥5 isolates were considered from the sample of 376 genomes. These draft assemblies (FASTA contigs) were formatted with makeblastdb. The local genome databases were searched for the presence of the serovar Typhimurium strain SL1344 genes slrP, sseK2 and sseK3 using TBLASTN. Homologous proteins encoded by genes mapping in SPI-7 and GI-6 from strain SBO13 were searched with TBLASTN. Only hits with ≥90% query coverage and ≥ 70% of identity were considered as bonafide homologues (except for SPI-7, where ≥40% identity was used as cut-off for pil-locus genes). Fisher exact test was used to identify STs statistically associated with human host (p-value < 0.05). We are grateful to the members of the Salmoiber CYTED Network “Control de la salmonelosis en Iberoamérica” (215RT-0493): Fernando C. Soncini, Eleonora García-Vescovi (Universidad de Rosario-CONICET, Argentina); Griselda Flores, José Pedraza (Universidad Autónoma Gabriel René Moreno, Santa Cruz, Bolivia); Lucia Yim (Universidad de la República, Montevideo, Uruguay); Coralith García, Lizeth Astocondor, Theresa Ochoa, Noemí Hinostroza (Instituto de Medicina Tropical Alexander von Humboldt-Universidad Peruana Cayetano Heredia, Lima, Perú); and, M. Graciela Pucciarelli (Universidad Autónoma de Madrid, Centro de Biología Molecular Severo Ochoa –CBMSO-, Madrid, Spain). Alfredo Hernández-Alvarez and Victor del Moral from the Centro de Ciencias Genómicas, UNAM, are gratefully acknowledged for help with server system administration. We acknowledge support of the publication fee by the CSIC Open Access Publication Support Initiative through its Unit of Information Resources for Research (URICI). This work was supported by grants 215RT-0493 from Programa Iberoamericano de Ciencia y Tecnología para el Desarrollo (CYTED), BIO2016–77639-P (AEI/FEDER, UE) and PCIN-2016-082, from Spanish Ministry of Economy and Competitiveness and European Regional Development Funds (FEDER), awarded to FGdP; and, grants DGAPA IN213516, CONACyT 239659 and FC-2015-2/950, awarded to JLP. PV gratefully acknowledges funding grants DGAPA-PAPIIT IN211814 and IN206318 and CONACyT FC-2015-2/879. Other supporting grants were from Comisión Sectorial de Investigación Científica (CSIC), Universidad de la República (Proyecto Grupos I + D 2014), awarded to LB. CS was supported by CONACyT FC-2015-2/879. The funding bodies had no role in in the design of the study and collection, analysis, and interpretation of data and in writing the manuscript. Draft genome projects have been deposited at DDBJ/ENA/GenBank under the accession numbers PVNR00000000 (BioProject PRJNA436348; BioSample SAMN08623074) and PVNQ00000000 (BioProject PRJNA436348; BioSample SAMN08623075) for S. enterica subsp. diarizonae strains SBO13 and SBO27, respectively, under BioProject PRJNA436348. The versions described in this paper are the first versions, PVNR01000000 and PVNQ01000000. JGL, FGdP, CS, LB, JAC and JLP designed the study. JGL, FGdP and PV wrote the original draft. All authors contributed with writing, reviewing and editing. JGL and PV performed the bioinformatic analyses. LB, JB and CS performed molecular typing. LS isolated biological material. All authors read and approved the final version of the manuscript. Human endocervical tissue and cerebrospinal fluid in which S. enterica subsp. diarizonae strains were isolated, were sent from Hospital ‘Materno-Infantil’, Santa Cruz, Bolivia, for microbiological analysis to the Centro Nacional de Enfermedades Tropicales (CENETROP) in the same city of Santa Cruz. These samples were accompanied by the mandatory medical orders for diagnosis. Patients signed a written document giving consent to the Hospital ‘Materno-Infantil’ for medical procedures required for treatment, including tissue sample collection and their use for analysis and research. Green ER, Mecsas J. Bacterial secretion systems–an overview. Microbiology spectrum. 2016;4(1). https://doi.org/10.1128/microbiolspec.VMBF-0012-2015.